Usable way to inform Ukranian secondary school children about the geography of France. 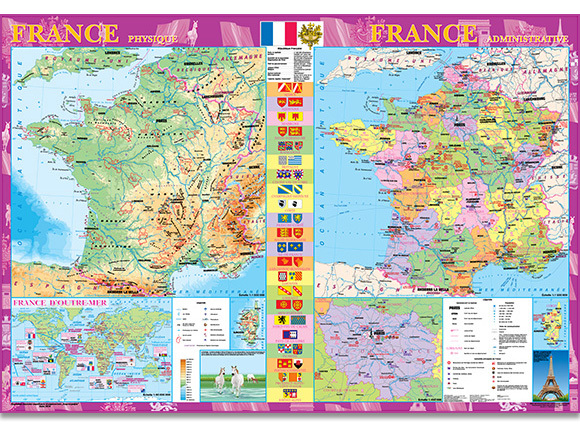 Publisher’s Description: The SSPE “Kartographia” has been publishing a series of school wall maps for the study of foreign languages over the course of many years – the wall map “France. Physigue. Administrative“ in French belongs to this series. The map consists of a physical map (FRANCE physique) with the scale of 1:1,500,000, an administrative map (FRANCE administrative) with the scale of 1:1,500,000, an inset (ILE–DE–FRANCE) with the scale of 1:450,000, the map of the French overseas territories (FRANCE D’OUTRE-MER) with the scale of 1:90,000,000, and the contextual decoration – flags and maps of the regions and statistical data concerning the country. Among the many map details, which reflect the unique character of the country, are architectural and historical monuments – parts of cities, medieval abbeys, palaces and castles, the sites, which hosted Olympic Games, objects of the national art of horse breeding, festivals, fairs, birthplaces of famous people, centers of national cooking, etc. Special attention is paid to the objects of the UNESCO World Heritage List. Hi, is it possible to buy a copy of this map? I would recommend to contact http://www.ukrmap.com.ua/en/ directly.